In its heyday, Borgward employed more than 23,000 people and more than one million vehicles rolled off its production lines. Now, a legend in the German car industry is back, after more than half a century. Committed to its legacy is why Borgward still stands for precision, progress and outstanding quality as a German car brand. The most modern know-how has been added to this, thanks to an international team of experts and intensive interaction with customers from all over the world.The German brand Borgward is setting standards again. Precision is the attribute that best describes the Borgward spirit. Borgward cars impress their owners – just as much today as back then. They fill their owners with just as much pride as more than 50 years ago as they give them the feeling of not just driving a beautiful, dynamic and functional car but also a unique car. The beginning of a new era for the traditional brand – that’s what the Borgward brand logo stands for. With its characteristic diamond shape, it is based on the world-famous Borgward trademark from the 1960s This stylish image of a diamond in elegant silver illustrates this unique brand’s premium claim as always. We develop concepts for our global activities from Germany at our corporate headquarter in Stuttgart. Besides opening up new sales channels, this also includes the strategy to revitalise the traditional brand. Our Borgward B-G-W strategy: the unique combination of tradition (Brand Heritage), the standard-setting art of German engineering (German Engineering) and international distribution (Worldwide Footprint). 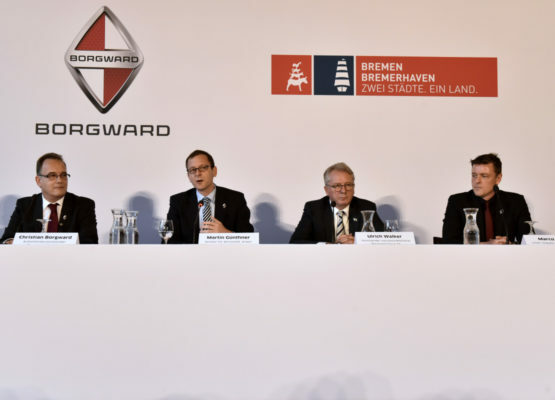 As a result, our intelligent, superb quality vehicles will not just raise the profile of the Borgward brand in Germany and Europe but also in the growing markets in the Asian and South American regions as well as in the Middle East.